Lam Research Corporation LRCX reported first-quarter fiscal 2019 non-GAAP earnings of $3.36 per share, which beat the Zacks Consensus Estimate by 15 cents. However, the figure decreased 36.7% sequentially. Adjusted revenues of $2.33 billion comfortably surpassed the Zacks Consensus Estimate of $2.30 billion and were slightly above the mid-point of the company’s guidance. However, the figure decreased 25.4% sequentially and 5.9% year over year. Following the results, shares of the company jumped 7% in after-hours trading. Lam Research shares have lost 18.9% on a year-to-date basis compared with the industry’s decline of 14.3%. In the quarter, Japan, China, Korea and Taiwan accounted for 29%, 25%, 16% and 12% of total revenues, respectively. Southeast Asia, United States and Europe contributed 9%, 5% and 4% of total revenues, respectively. Memory accounted for 77% of total system revenues. Non-volatile memory revenues represented approximately 51% of system revenues, while DRAM represented 26%. DRAM spending remained focused on conversions to both the 1x and 1y nanometer (nm) node. Foundry segment was stronger in the quarter, accounting for 17% of system revenues. Logic and other segment contributed 6% of system revenues. Non-GAAP gross margin contracted 170 basis points (bps) on a sequential basis to 46.4%. Non-GAAP operating expenses were $450.5 million, down 11.2% sequentially. As percentage of total revenues, operating expenses increased 310 basis points (bps) sequentially to 19.3%. Research & development (R&D) related spending accounted for almost two-third of operating expenses. Adjusted operating margin contracted 480 bps sequentially to 27% but was better than management’s guidance, primarily due to stronger gross margin and lower spending. As of Sep 23, 2018, cash and cash equivalents, short-term investments, and restricted cash and investments balances decreased to $3.9 billion compared with $5.2 billion as of Jun 24, 2018. Cash flow from operating activities was $720.3 million, up from $718.4 billion in the last reported quarter. Capital expenditures were $56 million, down from $80 million in the previous quarter. During the quarter, Lam Research bought back shares worth $1.7 billion and paid dividends of $174 million. For second-quarter fiscal 2019, Lam Research projects revenues of $2.5 billion (+/- $150 million). The Zacks Consensus Estimate is pegged at $2.53 billion. Management expected modest increase in customer spending across multiple segments. Gross margin is predicted at around 46% (+/-1%), while operating margin is expected to come in at 27.5% (+/-1%). Non-GAAP earnings are projected at $3.65 (+/- 20 cents) per share on a share count of nearly 163 million. The Zacks Consensus Estimate is pegged at $3.77. Management stated that Wafer Fab Equipment (WFE) expectations continue to grow slightly on a year-over-year basis in 2018. WFE is stronger in logic but slightly weaker in NAND and foundry. Lam Research stated that it is looking into 14 new fab projects in calendar 2019. Management expects first half of 2019 to be strong than the second half of 2018. Lam Research provided an optimistic long-term outlook. The rapid proliferation of next generation device and systems architectures, and the expansion of the materials in chip design and manufacturing creates compelling opportunities for the company’s etch and deposition expertise. Moreover, the company expects to eventually hit long-term operating margin target of 32-33%, with increase in DRAM, logic and foundry revenues. Lam Research expects about 1 million wafer starts per month of incremental capacity in the system related to non-volatile memory, over the long term. Currently, Lam Research carries a Zacks Rank #4 (Sell). Some better-ranked stocks in the broader computer and technology sector include ASML Holding ASML, Advanced Energy Industries AEIS and Broadcom AVGO. All the three stocks have a Zacks Rank #2 (Buy). You can see the complete list of today’s Zacks #1 Rank (Strong Buy) stocks here. Long-term earnings growth for ASML, Advanced Energy Industries and Broadcom is currently pegged at 18.74%, 10% and 13.32%, respectively. 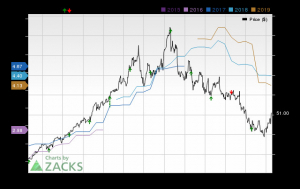 Why Is Advanced Energy (AEIS) Up 8.6% Since Last Earnings Report?